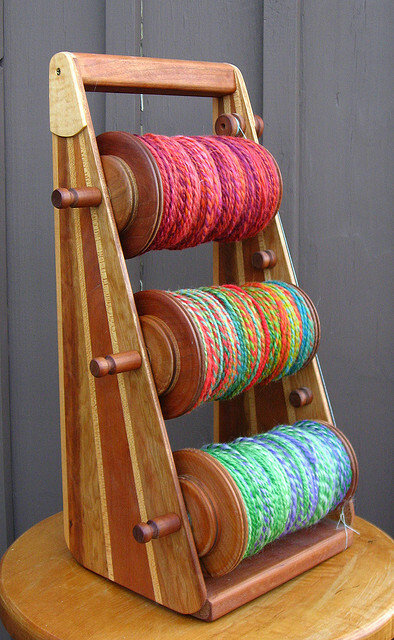 What if you want to spin more than 3-ply yarn? Apparently I am the only one who wants to make anything more than 3-ply yarn, because every single Lazy Kate on the market only has three bobbins. The problem is, I habitually spin singles that are on the thin side (no matter how hard I try to make them thicker). As a 3-ply yarn, my handspun yarn clocks in somewhere on the boundary between Sport and DK weight yarn. That's a little thin, you know? It seems that the "average" yarn is a thicker DK weight. Most patterns are made for this weight. It works well for hand knitting, for a number of reasons. 1. Take a page from the world of the drop spindle! When I used a drop spindle, I bought several small glazed flower pots. Wind your singles off into a ball, trap the ball inside the upside-down flower pot, and feed the end out through the hole in the bottom of the pot. Works great! 2. Improvise a Lazy Kate with a shoebox and a knitting needle. Punch holes in the narrow sides of the shoebox, put the bobbin on the knitting needle as a spindle, then slide the ends of the knitting needle into the holes. Cut a larger hole in the lid, close the lid, and feed the single out through the hole. 3. If you are handy, you can use a drill and a nice piece of wood to make your own multi-bobbin Lazy Kate tensioned device. Look how clever it is! I love how flexible the design is, and how all the plies are fed out together through the same point.